Everybody loves printing Master Yoda. In honor of the release of the 2nd preview for the new #StarWarsTheForceAwakens and of course as a giant bowl to hand out candy, I present my remix of Yoda as a bowl. 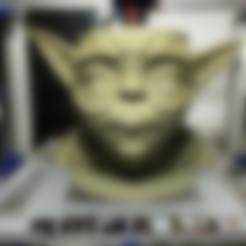 Best printed in Algae PLA, not just for the wonderful aroma and great yoda color, but to be able to say that you've printed a Yoda from the swamp. If you have access to a large format printer, this makes a perfect Halloween bowl.